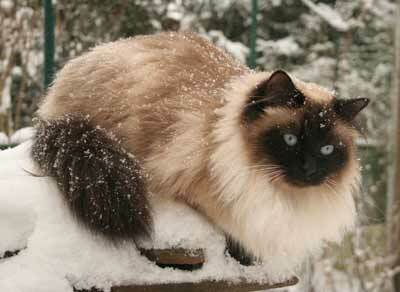 Insert form PKD database Siberian Cat and Neva Masquarade! Please make sure your cat isn�t allready listed in "complete database". If the cat is allready listed choose "add new informations". Your cat is not allready listed in our database? * The verification of the blood group by examination results is not required. In addition to blood group A, you may decide to specifiy if the cat carries blood group B. Your cat carries blood group B, if one of its direct parents actually has got B or if the cat has got a child which has got blood group B.
I am the legitimate owner of the cat mentioned above. I agree, that the information about my cat will be published in this database. Further on, I confirm, that all the information I am posting is correct and will be send to the webmaster for verification. Please tell us which colour this cat is. Is she seal point or red point? Please fill in in seperate words and small letters.